Unless one is so lucky as to have a benevolent sponsor, in many ways art is less likely to pay than crime. While it is often proclaimed that the best art is created in an environment of adversity, living pay-check to pay-check and always worrying about making rent at the end of the month is hardly an environment conducive to creation. When it feels like you’re putting yourself into your work, only to turn around and throw that hard earned money into the furnace of life, it’s easy to become disheartened, despondent, and depressed. So what is a struggling artist to do? Thankfully, there are some services in place designed specifically to help low to mid income households find affordable housing solutions. NYC Housing Connect is your portal to search and apply for city-sponsored affordable rental housing opportunities in New York City. Other government-sponsored options include the New York City Housing Development Corporation and the NYC Office of Housing Preservation and Development. The Actors Fund has two low-income artists’ housing buildings, one in Manhattan and the other in Brooklyn. Both buildings provide housing to low-income professionals, seniors and persons with HIV/AIDS, and are currently accepting applications. Applications can be found by clicking the link above. We at Brooklyn Arts Council know that navigating the ever-turbulent waters of New York Artist living is rough, but we urge you not to despair. There are people fighting in your corner! 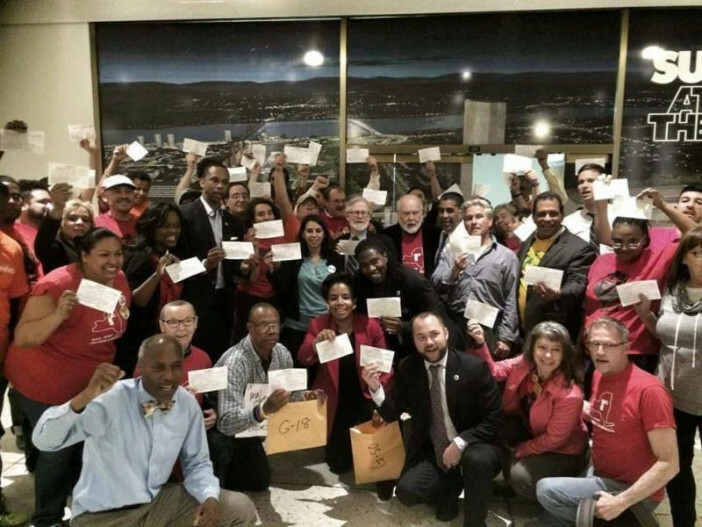 Just this week, many of your council members were arrested for staging a peaceful protest in support of stronger tenant protections and rent regulations. Where did this protest take place, you ask? Why, in front of Governor Cuomo’s offices of course! Council Member Jumaane Williams tweets his arrest. The Ditmas Park Corner beautifully summarizes the issue that Council Members sought to address: “With the current rent laws, landlords are able to charge a market rate on rent-regulated units once the rent hits $2,500 and the current tenant vacates the apartment — which, tenant organizers and other neighbors have said, can result in landlords illegally pushing rent-regulated tenants from their homes, including by not conducting necessary repairs to fix everything from ceilings that have caved in tolongstanding electrical problems.” For more information about the situation, click here. All those arrested were later released, and are due back in Albany soon for their court date. Photo via Councilmember Laurie Cumbo’s office.